Blue baby hat, socks and scratch mitts gift set perfect for a baby shower gift. 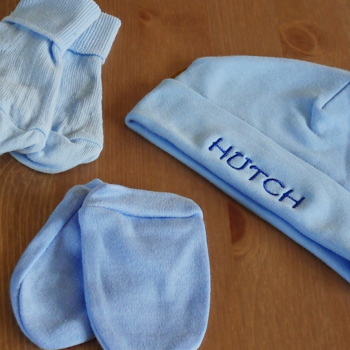 Blue baby hat, socks and scratch mitts gift set perfect for a baby shower gift. Fits approx. age Newborn 0-3 months babies. Comes with traditional baby socks in blue (no bear motif on them).